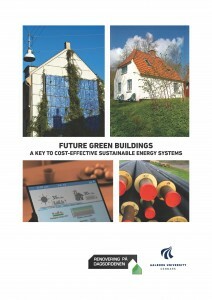 Efficient buildings are essential for an affordable Danish energy supply in 2050. The purpose of this report is to describe the contribution and role of the building sector in a 100% renewable energy future, as well as the transitions that are necessary in the building sector to support this change. The report builds on a literature review encompassing more than 50 reports and research papers over the last 10 years and more than a two decades knowledge about the interactions between different components of the energy sector. The review has been focused on aspects such as cost-effective solutions from an energy system integration perspective, heat savings, electricity savings, and user behavioural aspects as well as energy storage and household level flexibility. Many reports on green or sustainable buildings focus only on savings levels and disregard the cost of renewable energy production. Some reports focus on building level on‐site renewable energy production optimising storage for passive houses or net‐zero emission buildings. The question is, how far should we go with savings? What is the role of flexible demand or storage at the building level? And to what extent should on‐site renewable energy production be the solution?